Who took the time to fill these out? We didn't have hall passes, so the only perk that came with being a nerd at my elementary school was that you got picked to deliver notes between teachers or from the teacher to the principal's office. Little did they know how much I loved to escape the classroom and read the notes. Those little missions that teachers would send you on were weird. That's when I would hit the water fountain and fold up looseleaf paper and stick it in the big part of the jet so that the water would spray out of the little hole and clock kids in the eye. If you did it right it could shoot out like four feet. 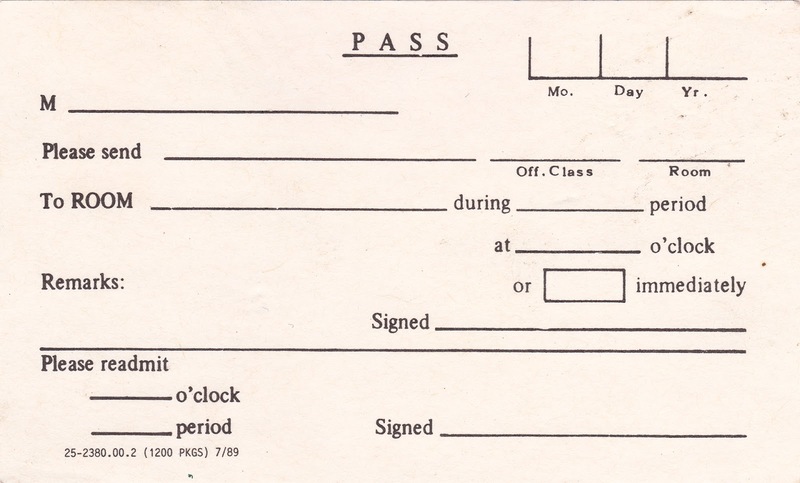 We used to use hall passes, late passes, bathroom passes, office passes, gym passes, etc. It was the worst. When I was 5 mins late, I would have to get a late pass. By the time it was filled out, signed, and notarized I was 45 mins late! you should have misplaced it on purpose.